Why not try looking for the answers here at first? 1) Where can I purchase the original BlackVue products? 2) How to register the warranty for the product? 3) What is the warranty period for the product? BlackVue dashcam comes with 12 months warranty if purchased and installed by our local authorised dealers. Please ensure that the product that you purchased comes with our warranty card. 4) Do you provide the repair service for the product is out of warranty? Yes, we provide repair service for the product which was purchased from our authorised dealers or from us earlier. 5) Do I need to make an appointment before coming for repair service? 1) Where is your product made? BlackVue is manufactured by Pittasoft in Seoul, Republic of Korea using the highest quality and reliable components. 2) Is your product compatible with Mac OS? Yes, all BlackVue cameras are indeed Mac compatible! 3) How you connect the power to BlackVue? 2) BlackVue records even when the engine stops (parking mode), this is made possible with the option of Power Solutions. a) Power Magic Pro, taps the power from your car battery. 4) Can you install BlackVue in trucks, lorries and others? 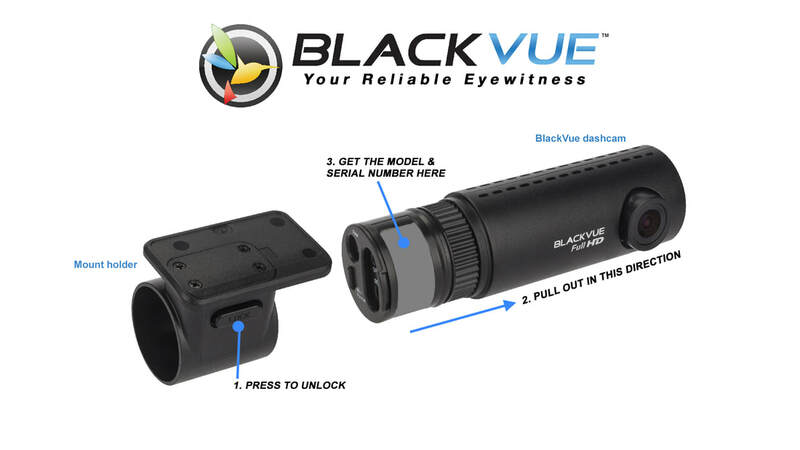 BlackVue products is 12 and 24V DC compatible. We also can supply AC adaptor for use in other places out of your vehicles. 5) What is parking mode? You can learn more about parking mode from this link. 6) Where is the typical location for the installation of BlackVue, Power Magic Pro and Cellink battery? For BlackVue, it will be located behind the rear view mirror. Some cars with rain sensor located at the lower part of the rear view mirror, hence BlackVue may needs to be positioned at 1 or 2 as illustration above. For Power Magic Pro, it is typically located below the dash board and easily accessible when in needs. .
​For Cellink battery, it is normally hidden below the seat or inside the dashboard since it is hassle free product that does not requires users intervention. Note: All wires will be concealed neatly if the product is installed professionally by our trained authorised dealers. 7) How much time is needed for the installation? Typical installation by our authorised dealers is around 45 minutes for our single channel dashcam (front only) and about 1.5 hours for Dual-channels (front and rear) dashcam. 8) Does it perform loop recording or auto deletion when the memory is full? Yes, BlackVue will start recording automatically upon power ON. When memory is full, it will automatically delete the oldest file one by one. 9) How much time the memory card records before it starts to overwrite? This is very much depending on the model of BlackVue dashcam, memory size and quality setting. ​Please refer to the information here. 10) What kind of recording format used? 11) How many type of files recorded? There's 3 types of files recorded which is Normal (N), Event (E) and Parking (P). Normal file is recorded when BlackVue is power on. Upon detecting any sudden impact, Event file will be created. Parking file is created when motion is detected while in parking mode. NOTE: DR650 series and DR750 series supports additional Manual (M) file which can be manually activated by touching the sensor. Function for the sensor is default for Voice On/ Off control but can be switched to Manual Recording On/ Off by accessing the settings. 12) Can I used other third party memory card? We recommend using BlackVue microSD cards for optimal performance. The reason is that dashcams put microSD cards under higher stress than most electronic products such as action cameras or DSLRs due to their constant loop recording. We test our cards extensively before selecting them for inclusion in our products, to make sure that their performance is good and degrades as little as possible over time. Using third party microSD cards can affect dashcams' performance and in some cases, force the dashcam to reboot or hang up randomly and the memory card may fail prematurely. Note: Although the basic requirement of the microSD cards for BlackVue dashcams is Class 10 or U1 and that the SD card should be formatted as FAT32 [Windows] or MS-DOS (FAT) [Mac OS], we cannot guarantee the perfect performance of cards from other manufacturers, as even cards with same specifications may vary from batch to batch. Every BlackVue dashcam comes with an original BlackVue microSD card. In case it is missing or replaced by a third-party microSD card at the time of purchase, please contact the seller to make sure you get a genuine BlackVue microSD card. 13) Do I need to perform maintenance to the memory card? A memory card gets worn out when it goes through many read-write cycles which may cause errors. Those errors unaddressed may seriously damage the memory card hence shorten the life cycle. Compared to the fairly sedentary lives led by SD memory cards in digital cameras, smart phones and tablets, those used in vehicle dashboard cameras are exposed to a number of stresses. These include large and rapid variations in temperature and humidity, sudden interruptions, instability and ‘spikes’ in the power supply and constant mechanical vibration, any of which can lead to faults that can result in data loss or corruption. 14) How do I connect the BlackVue to the smartphone? The BlackVue DR650 series cameras have built-in WiFi which allows them to connect to a smart phone device or tablet device via the BlackVue application. This can be downloaded free from the Apple or Android app store. When connecting your camera to your phone/tablet device, please make sure that WiFi has been enabled on the camera and the phone. You then go into settings and find the signal of the camera i.e 'DR650GW-?????'. Use the default password 'blackvue' to connect to the camera. Once successfully connected to the camera via the WiFi connection you can then start the BlackVue application and log in to the camera to view footage, download footage, change settings and more. 15) Do you have 4 channels dashcam for front, rear, left and right coverage? We could use 2 sets of 2 channels dashcam product to achive close to 360 degree coverage. 16) Will tinted films affect the performance of BlackVue? Tinted film which is too dark may cause poorer recording quality. Anyway, you can adjust the brightness setting by using BlackVue app or Viewer software as to improve the recording quality. 17) What is the BlackVue Over the Cloud? BlackVue Over the Cloud is the solution for our Cloud service. Find out more here. 18) How do I check if my BlackVue is compatible with BlackVue Over the Cloud? If you are using DR650GW series, please visit here to check compatibility. Otherwise, you can compare the existing dashcam models which is compatible with our Cloud service here. 1) How to format SD card? a. Compatibility is guaranteed only with the official BlackVue microSD cards. b. In case your card is an SDXC model, formatting directly from the BlackVue will cause it to become unreadable on Mac OS computers. Formatting the card from the PC Viewer for Mac or Windows will prevent this issue. ​Only use the memory card designed for dashcam application with MLC Class 10 specification such as BlackVue card to ensure durability and reliability. a) Latest models include DR750S-1CH, DR750S-2CH, DR590-1CH, DR590-2CH, DR650S-1CH, DR650S-2CH, DR450-1CH, DR430-2CH, DR470-2CH and DR490L-2CH. Before you format the SD card, please back up any important video files before proceed. Manufacturer recommends to format the SD card at least once a month as to maintain the recording stability. Detail procedure can be found from here. ​b) If you had formatted the 64GB or 128GB memory card using SD card formatter (Item B) or normal PC OS, you still have to format the card using the BlackVue Viewer software as to change the format to FAT32 before it can be recognised by BlackVue. C) FULL FORMAT using SD card formatter. In case you have issues with your microSD card, we recommend to format it using this software rather than the formatting tools provided by default with your operating system. Detail procedure can be found here. 2) How to upgrade the firmware? Please follow the procedure here. 3) How to change or reset the WiFi password? If you don’t use the Cloud service, you can adjust the Wi-Fi auto settings. 1. Go to your smartphone’s Settings > Wi-Fi and connect to your dashcam. 2. Open the BlackVue app. Select BLACKVUE WI-FI > Settings > Cloud settings. NOTE: For DR750S series dashcam, even you had switched the WIFI AUTO TURN ON to OFF, the WIFI will still ON for about 5 minutes upon power ON. 1. Remove the microSD card from the dashcam. 3. Run the BlackVue Viewer program. 4. In BlackVue Viewer Go to Settings (Windows) / BlackVue Viewer-> Preferences (Mac) to access the settings panel. 5. Click on Cloud Settings tab and under Enable Cloud Service, choose Off. 6. Click the Wi-Fi & Other tab and and adjust the desired Wi-Fi auto settings. This message can sometimes be received on smart phones when trying to connect to the camera using the WiFi feature. This can be caused when the user goes straight into the BlackVue App of iOS and tries to connect to the camera without going into settings first and connecting to the WiFi network of the BlackVue camera. To fix this issue, please go into Settings on the phone then to WiFi networks. Just as you would connect to a home network, find the BlackVue SSID on the list of available WiFi networks and connect using the password 'blackvue'. Once connect go back to the App and you will find the phone is now able to connect to the BlackVue camera using the App. 3. Choose your BlackVue dashcam from the network list. The dashcam’s default SSID begins with its model number (e.g. DR650S-ABC123). ​4. Enter the password (the default password ‘blackvue’) and tap Join / Connect. A) This problem is most likely due to a faulty SD card or file issues on the SD card. Please format the SD card completely and re-insert the card back into the camera. If you're using the memory card for more than 6 months, there's a possibility that the memory card performance had deteriorated hence please replace with a new memory card. If this problem re-occurs and is not fixed by formatting the card or replacing with new card, please send your unit back for a warranty claim or repair. B) If before the system restarts, there's message "Resetting the Time", this problem is due to the system is trying to re-adjust the date and time which is out of sync with the GPS. If this error occurs frequently, please send your unit back for warranty claim or repair. C) If before the system restarts, there's message "Powering down", this problem could be due to intermittent power source for example poor connection of the installation. Please contact the installer for a check. Make sure that you set the time zone correctly using the BlackVue App or BlackVue Viewer for example, Asia > Singapore or +8 GMT. BlackVue systems use a RTC (Real Time Clock) internal battery to maintain an accurate time & date. If there is an issue with system or the RTC battery has come to the end of its life, the time & date may go out of sync. Please contact us for for warranty claim or repair. Download the latest firmware from our download page and update to the BlackVue dashcam. When GPS signal is detected (GPS Blue LED is lighted up), dashcam will auto adjust the date and time and reboot the system. 8) Camera says "Please check SD card"
If your camera is fairly new and this error message happens, it may be caused by a failed card or faulty unit. A) To do this wait until the unit is on and operating and then hold down the WiFi button for a good 10 seconds, shortly after a format of the SD card will begin. If you have the DR3500FHD or other models the format option is achieved by holding the Mic On/Off button down. B) If the error keeps repeating upon power ON and format button doesn't work, you need to format the SD card using the PC instead. Please refer to item 1) above. The manufacturer recommends the user to format the SD card at least once every 4 weeks. The process is very quick & easy as described above by simply hold down the button for 10 seconds. NOTE: Your settings & preferences will NOT be lost when carrying out this format but please backup any important video at first. If the error still occurs - it could be as a result of the SD card being faulty in the camera. In the event your SD card becomes faulty within the warranty period, it will be replaced free of charge. Memory card is a consumable item, please replace with a new BlackVue memory card for full compatibility and stability. If replacing a new SD card does not correct the issue and the camera still gives this error message, the camera itself may be faulty. Please contact us to intiate a warranty claim or repair for your camera. 9) Camera says "No SD card, please insert SD card"
A) Please ensure that the memory card is inserted properly to the slot of camera and readable when inserting to PC. If memory card is not readable by PC, this means the memory card is defective hence you need to replace with a new one. B) For DR350 model, please ensure that you had installed the firmware to the memory card before inserted to the camera. Firmware for DR350 and be downloaded from our download page. C) If you are using 64GB or 128GB third party memory card, please format the memory card using BlackVue Viewer at first. Procedure on item 1 above.